As technology changes so has the entire TV industry as the once prominent high definition resolution has now been replaced by four times more. The wave of UHD 4K TV’s are here and they now include the best in connectivity with Smart technology. This has bred a shift in viewing right in the comfort of your own home which will soon replace your HD TV with an Ultra HD 4K Smart TV. 4k technology offers four times the resolution as HD and as consumer demands catch up with new wave technology it’s only a matter of time before we say out with the old and in with the new. Giving you an upgrade in visuals which include better contrast, vibrant colors, deeper blacks, and better frame rates in a size that’s not too small and not to big is exactly what you’ll find in the following 55-inch 4K Smart TV’s. The following review details the Top 5 55-Inch Ultra HD 4K Smart TV’s in 2018 which takes everything into account including price, quality, performance, and much more. LG Electronics has helped redefine the entire industry and their lineup of OLED Smart TV’s are one of the biggest reasons why. This 55-inch LG 4K Ultra HD TV offers the best in technology while keeping the price affordable for the average consumer. If you’re looking for a 4K TV with Smart connectivity that will become the centerpiece in your home for years to come, then this is it. With hundreds of all-positive reviews on Amazon, it’s easy to see why this 2016 LG OLED TV is the best 55” model out there. Offering an Enhanced High Dynamic Range Display with Dolby Vision which gives you vibrant colors and some of deepest blacks we’ve ever seen in a TV. Highlight features include Perfect Black, Harman Kardon sound, Cinematic Color, and WebOS 3.0 Smart Technology, you’ll see what manufacturers intended TV to really be. This is the 1st of four 4K Samsung TV’s in this review, and if you’re looking for an affordable option which comes in hundreds less than the others than this is it. This Samsung 55-inch Smart TV with a 3840 x 2160 resolution comes in at under $800 which is a steal at this price. Powered by a quad-core processor and gives you an upgrade in visuals with High Dynamic Range. Some of the highlight features include Micro Dimming Pro, Wide Color Enhancer, UHD Dimming, PurColor, WSI-Fi, and a picture engine which gives you UHD Upscaling options. Complete with HDR Premium which is an upgraded technology which is formatted to work with next generation peripherals such as streaming devices, 4K Blu-ray Players, and storage devices. This 55-inch 4K Smart TV features Samsung’s own Quantum Dot Color Drive. This new technology gives you some of the best visuals which equates to more than a billion colors than standard high definition resolution. The Triple Black technology gives you the best shades of black and contrast which creates lifelike visuals and some of the best shading we’ve ever seen. Out of the box you’ll get Samsung’s Smart Remote. From one remote you can control all your connected peripherals via Wi-Fi or Bluetooth including gaming system, Blu-ray player, surround sound, streaming device, and much more. The near bezel-less display allows you to enjoy more than a billion color patterns while taking full advantage of Samsung’s own HDR 1000 High Dynamic Range. If you’re looking for the best 55” 4K Smart TV which offers the same great viewing from any seat in the room, then this curved 4K TV is it. This newer model is one of the first to offer Samsung’s 4K SUHD Picture with Quantum Dot Color Drive. The Quantum Dot technology gives off more than 1 billion colors which produces a lifelike viewing experience with four times the resolution of high definition. The beauty of this new model comes in the curved display which offers the same great viewing from any seat in the room. With no-glare viewing even if you’re sitting on the outside of the room, those in the middle will not have the best seat in the house. Some of the best features include HDR 1000, Triple Black Technology, UHD Dimming, and a Smart Remote which will become your new universal best friend. Coming in at under $800 with free shipping is this curved 55” 4K Smart TV from Samsung. This is easily one of the best 4K bargain TV’s out right now and it comes complete with Smart technology which gives you Wi-Fi and Bluetooth connectivity. Designed to meet the needs of extreme gamers and sport enthusiasts alike, the 120MR gives you seamless transitions from frame to frame with no lag. 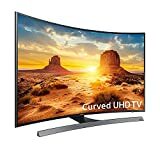 This curved Samsung 55” 4K Smart TV is a significant upgrade over the former model which features a 4 times sharper resolution than standard HD. Featuring Samsung’s own Upscaling Picture Engine you’ll get an automatic upgrade from traditional resolution shows and movies to a near ultra-high definition resolution. Smart Hub will become your very own central command which is an intuitive and easy to use platform to access your downloads, access to peripherals such as Blu-ray and consoles, and to stream content. Be sure to tell us your thoughts about this review on the best 55-Inch Ultra HD 4K Smart TV’s in 2018 and if you have anything to contribute feel free to drop us a comment below.